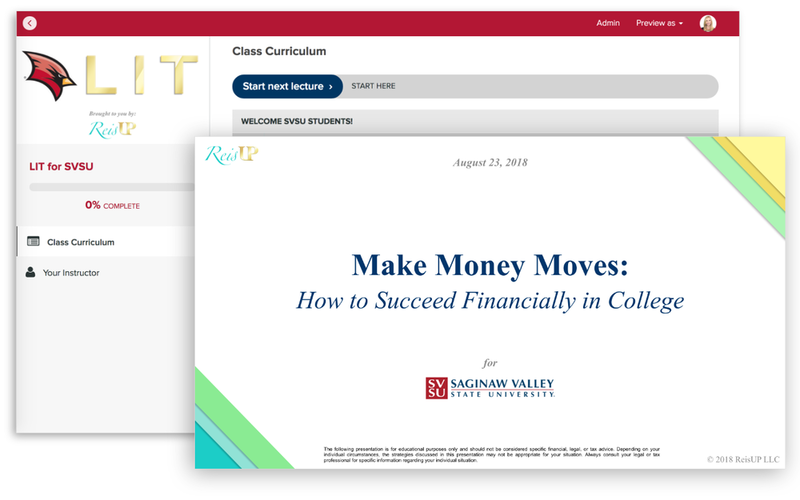 SAGINAW, August 23, 2018 /ReisUPdates/ -- On August 23, 2018, Tara Falcone, CFP® and Founder, traveled to Saginaw Valley State University (SVSU) to officially kick off financial literacy efforts for the 2018-2019 academic year. There, she led a Make Money Moves workshop and launched a customized, co-branded LIT ™ platform for student participants in the University’s GEAR UP program. These students are the first in the country to gain access to LIT, which is particularly meaningful since Tara, herself, hails from Michigan. Many more students at colleges across the country will be joining them soon. During the workshop, students identified their financial behaviors, set achievable money goals, and excitedly shared them with fellow classmates. They also learned how to keep their student loan balances to a minimum and acquired strategies to help them succeed as they move forward in this exciting new stage of their financial lives. ReisUP will employ multiple methods of communication to actively guide students through the content. Tara looks forward to being a financial role model to fellow first-gen, low income students and is excited to help them build a strong financial foundation while in college. For questions or comments, please contact info@reisupllc.com.